This book critically explores how increased regulation and governance of corporations can be used to help improve the rights of workers amidst an era of union decline. The book posits that soft law techniques such as codes of conduct are more effective in protecting workers than ‘hard law’ i.e. domestic regulation. It starts by analysing the transnational regulation of corporations and codes of conduct, and then puts forward a model code of conduct that can be used by corporations to help increase the protection of workers. This model is one where, through the use of a monitoring scheme, shareholders, activists and NGOs put pressure on the corporation to reform itself and enact a code which has obligations flowing both ways between the corporation and its employees. The book then looks at the expansions of fiduciary duties and changes to corporate governance, including benefit corporations and how this can be used to increase the rights of workers. It then discusses changes to standard union contracts before concluding with an assessment of the best way forward for workers’ rights. 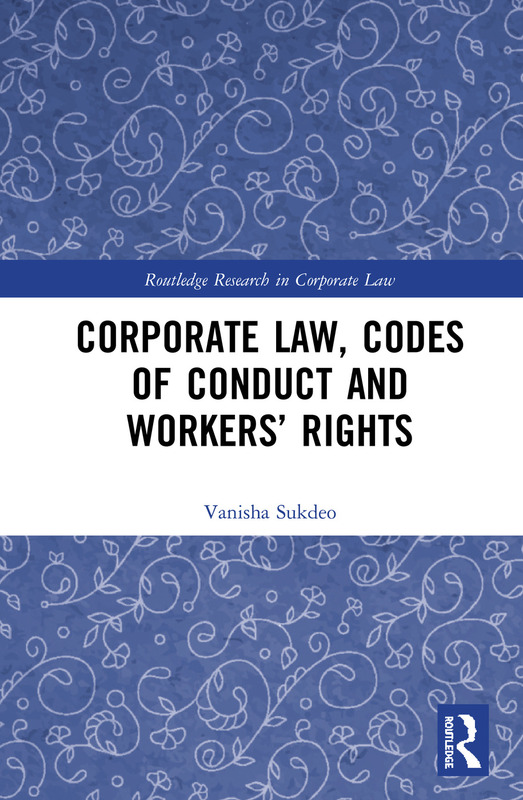 By providing a new contribution to the current dialogue on corporate social responsibility and codes of conduct, this book will be a valuable resource for academics working on labour, employment and business law, as well as corporate lawyers. Theory of the Firm - how does the corporation function? Governance gap? Or governance gaping hole? What comes after Peoples and BCE? Vanisha H. Sukdeo is a Course Instructor of Law at Osgoode Hall Law School, York University, Canada. The credit crunch of 2007 and the ensuing financial crises have led to a renewed interest in the place of corporations in the modern world and the role of law and regulation in governing their behaviour. This series looks to survey the current developments within the field of corporate law as well as mapping out future opportunities for change. The series offers a comparative approach to the subject, looking not just at North America and Europe but also at the state of affairs elsewhere in the world. Written by influential scholars, the books offer thought-provoking and often critical analyses of corporate law. The functions and legal obligations and rights of multiple stakeholders including directors, investors, governments and regulators are examined from both empirical and theoretical standpoints. Whilst being grounded in law the series also draws upon research from the disciplines of economics, management studies, sociology and politics in order to explore the implications of corporate law in their wider social and economic context.